This entry was posted on May 8, 2010 at 3:23 am and is filed under ...all the old familiar places, JP's Dedham. You can subscribe via RSS 2.0 feed to this post's comments. You can comment below, or link to this permanent URL from your own site. I remember Frosty’s! While we ate our cones, we watched the planes take off and land from the Norwood airport. Congratulations, Susan, you’re the first visitor to the blog- you’ve won a large Frosty cone! To obtain your prize, just go down to Legacy Place, stand somewhere in the vicinity of P.F. Chang’s parking lot, and wait for a hole to rip open in the space-time continuum. Enjoy! Maybe Susan is thinking of Neponset Valley Farms – further south than Art Johnsons? 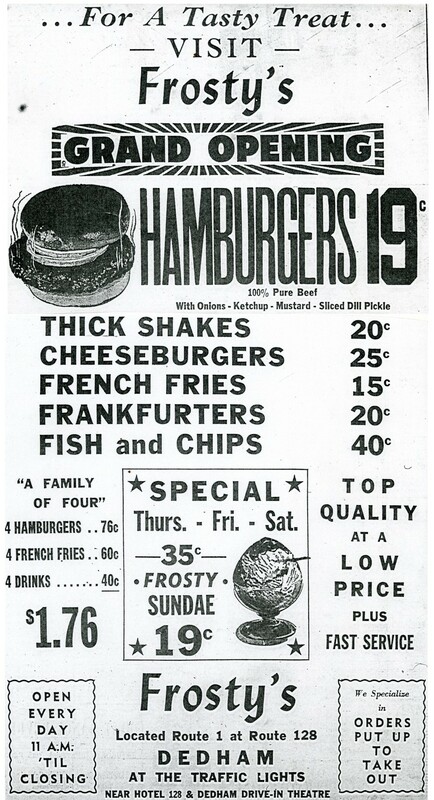 frosty’s only opened in 1963? what year did it close/was torn down? gotta love the family of four dinner for $1.76! I wonder if big tippers dropped down two bucks and left the change. 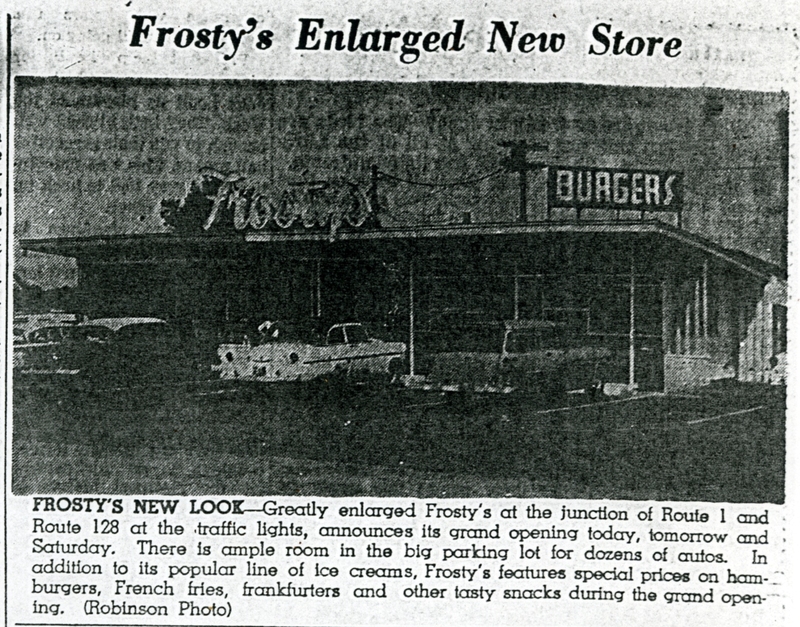 I’m told by a life-long resident who once worked there that Frosty’s used to be on the Westwood side of old 128, so 1963 must have been their grand re-opening. A little more time in the library’s microfilm files and I’ll have the year that Showcase opened- and Frosty’s disappeared. There is a J.P. Licks store at the new Legacy Place, so it’s good to know the tradition of getting ice cream at that spot still lives on…sort of. Well, the Showcase was open by 1975, ’cause I remember seeing Jaws there. And by the way, have you bought a book yet? Across from Frosty’s, down the street, on the old Rte. 128 (now Rte. 95), there was a large windmill ice cream shop that had booths + pin ball machines inside. During the spring + summer during the 1950’s, one would take a “Sunday drive” w the family to purchase an ice cream cone – out in the country! Frosty’s seems to be one of the most cherished memories of people growing up in Dedham in the ’50s and ’60s- lots of Google searches for it! It moved to the corner of Rte 1 where Legacy Place is now in 1963. Thanks for sharing! Growing up in Dedham my parents would take us to Frosty’s as a “special treat”. If I’m not mistaken the A&P was diagonally across the street the where Joe’s American Bar & Grill is now. That was the First National Supermarket, not A & P. my aunt was a butcher there. We all called it “The First Nasty”. Joes Bar and Grille is the old HO-JOs First National was to the right of it. Prior to The First National it was a golf driving range. It’s so hard to remember exactly when things happened through the “haze” of time, but, I and all of my three brothers worked at Frosty’s for many years, each taking our turn. The owner was Joe Herbert and he was the sole New England representative of the machines (Taylor) that made the soft serve. His main office was right across from Fenway Park and the old Sears building in Boston. He also was in partnership with a man who opened the donut and hamburger side restaurant as well as a Mr. John Walsh who owned and operated the large ice cream truck that travelled all through Boston suburbs selling the exact same ice cream products that Frosty’s in Dedham sold. I was there the day the hamburgers began to be sold and remember the fast pace of assembly line like making of the food. It was like an early McDonald’s, cook them up and squirt the condiments onto them,hard to keep up with the demand as the cost was so low. Many of my high school friends worked there too. As for exact dates, I grew up on the Westwood / Dedham line right near where the first location was and I too remember the Windmill restaurant near there before the new 128 came through. Frosty’s entire building was moved to the rte. 1 and Elm Street location about 1957 or 1958 as I remember beginning to work there cleaning the yardand emptying the barrels about that time. I got $2.00 each time I cleaned it but the nice waitstaff would give me anything I wanted to eat or drink, a treat for a hungry / thirsty kid.. Soon I worked my way indoors and eventually became the manager. So glad it has become a part of collective Dedham memories as it’s always been a fun memory for me. Thanks for the postings! Frank, thanks for all the great tales of Frosty’s. Frosty’s is one of the most popular search terms that lands people at my blog. Do you happen to have any photos I could post? Don’t forget the Windmill ….. on the Dedham/Westwood line where the rotary of 128 is now. I remember Frosty’s and the treat to get soft serve ice cream. And mix of french fries, clams, burgers an d onion rings filled the air. Such sweet memories. Grew up in Islington. I remember that whole area back in the ’70s: Frosty’s, the First National Supermarket, The Red Coach Grill, Ford dealership, Bruce Animal Hospital, and didn’t there used to be a drive-in theater behind Frosty’s? Anyone remember the basket shop at the intersection of Elm and Washington St.? How about the Chinese restaurant in Islington across the street from St. Dennis church? The Apple diner, Mary Hardigans, Ligget’s drug store, Woolworths at the Plaza with the food counter, Grants, Touraines, the Fashion Barn at the end of East St? As a First National bagboy I used to have lunch at Frosty’s…but not too often – the “cheap” menu wasn’t so cheap when making $1.15 an hour! Indeed there was a drive in theater behind Frosty’s. Oh, and it was Howard Johnson’s and Mary HarTigan’s. I believe Dave is right: Susan is probably thinking of Neponset Valley Farms…you’d have to have Superman level eyesight to see Norwood Airport traffic from Rt 1 and 128. My father worked in Dedham Square from the 1950s to the 1980s at DeVoe Motors (now a CVS). I remember the Dedham Drive In– saw 10,000 BC and Mary Poppins there. The Showcase Cinema later took over the spot (or at least its parking lot– I do not remember Frosty’s). i remember Bruce Animal Hospital– we took our dogs there a lot and there were long waits in an animal packed waiting room. I remember Child World was originally in the block of stores on Rte 1 at the first light off 128 on the right. CW then moved farther down the street opposite Dedham Square, then to the Mall (I believe) the outta business. I think it was a HoJo at the exit, later sa Holiday Inn. 128 was built in Dedham on top of the old road but Rte 1 was formerly an at grade crossing so the exit and bridges were used. Old 128 was the southbound lanes of what is now 128/ I-95. They just built a new 2 lane road parallel to it. Of course since then both sides have added a couple of lanes.